(CNN) — Ivan Lopez’s friendly smile apparently gave no hint of a history of depression, anxiety and other psychiatric disorders. 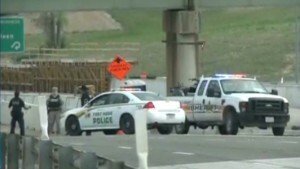 The Iraq war veteran was being evaluated for post-traumatic stress disorder before he opened fire at the Fort Hood Army base in Texas on Wednesday. He took his own .45-caliber handgun onto the sprawling base and killed three people and wounded 16 more before taking his own life, leaving authorities to piece together what in his background and medical treatment could have triggered a new round of bloodshed at the same Killeen base where an officer killed 13 people in 2009. Lopez, a 34-year-old specialist, served four months in Iraq and was undergoing treatment for mental health issues. A native of Puerto Rico, he was married with a young child and moved to the post in Killeen in February from another military installation. He moved into an apartment there with his wife and their daughter a little more than a week before the shooting. They appeared to be a normal couple, said neighbor Xanderia Morris. “They would smile whenever they’d see someone,” she said. There aren’t indications that this was a terrorist act, but officials said they won’t rule anything out until the investigation is over. 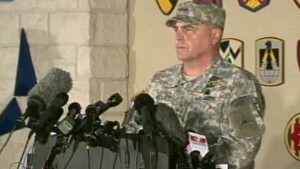 Lt. Gen. Mark Milley, the post’s commanding general, told reporters late Wednesday there were reports of an argument.